Tanya Zhang, alongside her cofounder Wesley Kang, built Nimble Made after realizing that so many of their slimmer family members and close friends all had the same problem - finding dress shirts that actually fit slim men. So Tanya and Wesley set out to close the gap and create actually-slim dress shirts for men, especially Asian American Pacific Islanders, who have trouble finding a dress shirt that properly fits. Not only is Nimble Made solving a problem, but they have built a beautiful brand. Prior to leaping into the entrepreneur life, Tanya was a professional designer which was instrumental in helping her build a cohesive and well-thought out brand identity for her new startup. Tanya was kind enough to share how she built the Nimble Made brand and her top design & branding tips for fellow entrepreneurs. I was born & raised in the suburbs of Los Angeles, California. I graduated from the University of California, San Diego with STEM education and degree in Interdisciplinary Computing & the Arts. I also danced hip-hop all throughout college as director of an all-female hip-hop dance team! I moved to NYC to start my career as a designer and am constantly inspired by the city. On the side, I celebrate wellbeing for Asian women's personal & professional growth as the Head of Community of The Cosmos. 2. How did your design background help as you began building Nimble Made? With my experience working as an art director and designer on a variety of brands and clients big and small, I have really honed in on what it means to create a cohesive and thoughtful brand identity for the end consumer. Building Nimble Made as its creative director actually came very naturally to me. Without a doubt, I knew I wanted to put design thinking & customer strategy at the forefront of developing Nimble, along with the brand’s look & feel. But trust me when I say there are maaaaany aspects of building the brand that does not come as easily (cry)! It is definitely an ongoing, learning process. 3. How did you come up with the name & logo? Paving the way for a slim men’s dress shirt brand, I was looking for a name that worked in parallel to the “petite” line for women’s fashion, but without the negative connotations for men. I was brainstorming synonyms for words like “lean” and “quick” and came across Nimble which is pretty unique (and great for SEO!). The logo luckily came very easily for me. For the simpler logo (nm), I was looking to design a word mark that was classy, but not too high brow, since we pride ourselves on creating affordable dress shirts for men (they’re $80 each with discounts that run continuously on the site). I saw an “n” in the “m” and combined the two to represent Nimble Made. For the spelled out logo (nimble made), fashion brands traditionally use a thin, serif font either in title case or upper case. Our logo word mark uses a slight rounder and lower case font for a more casual, friendly and approachable vibe. 4. What was the branding process like? I’m methodical in my processes and am very data-driven (yay data!). Much of the initial brainstorming included close friends, family, friends of friends and even strangers because feedback, different perspectives, and opinions are extremely valuable especially when creating a brand. These are people who are potential customers in the future! I created a private Instagram account where I polled a small focus group community on various topics like the logo, color palette and fabric options. 5. What are your top 3 design & branding tips for fellow entrepreneurs? Know your strengths and weakness. If design & branding is not in your wheelhouse, find a designer so you can be laser focused on what you are good at! Pay close attention to how the competitors in your landscape are branding themselves. What message are they using? What is their look & feel? What do you like about their design & brand? What don’t you like? And start your brand from there. At a high level, lay out the brand’s mission, values, and definitions of success (seriously, write them down). Sometimes they change on your journey and that’s okay but having the solid footing ensures that you’re working towards the goal of owning a cohesive brand with a strong identity. 6. Where do you like to find design inspiration? I’m constantly looking at Behance and Dribbble and am subscribed to a number of design newsletters. I also follow artists that I like on Instagram! I have a chrome extension that shows a design dashboard by Muzli with relevant design stories and inspiration curated for me whenever I open a new tab on Chrome. Also, not so much design inspiration, but I love reading and reading books written by successful entrepreneurs. My goal is to read 60 books in 2019 – wish me luck! 7. 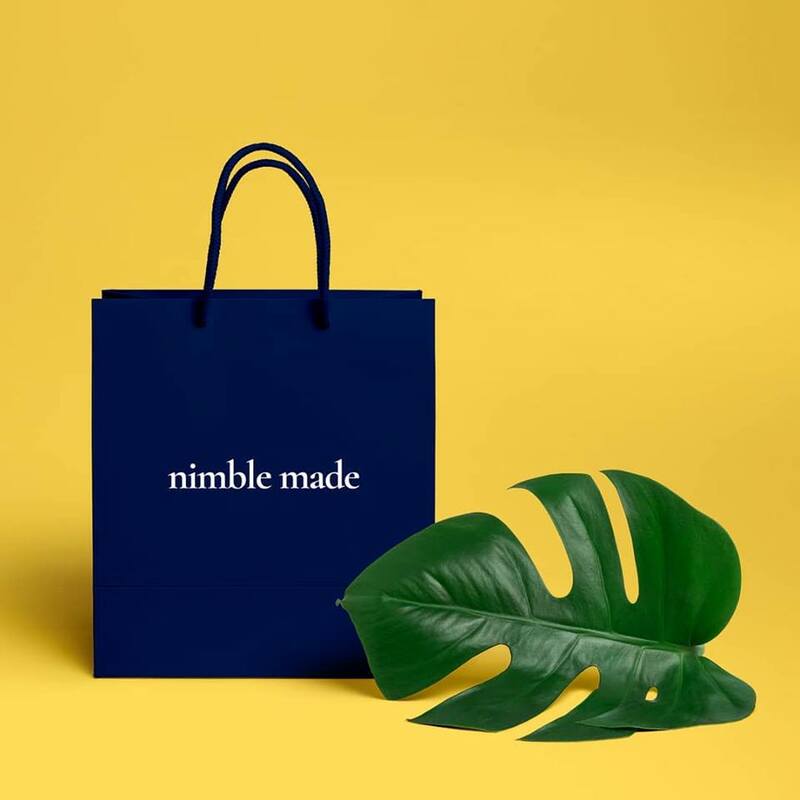 What was the hardest part about launching Nimble Made? Yikes. The hardest part was actually the step right before it. Taking the leap of faith to invest in yourself and your brand is scary. Culturally, as an Asian American, I had to convince my parents, who broke their backs immigrating to the US so that I could have an brighter future, that building my own thing was the right move for me. It also doesn’t help that there is a lack of representation of successful Asian (& Asian women) entrepreneurs. 8. What is one thing you wish you knew before starting a company? I thought that leaving my full-time job meant I was getting more time back to work on Nimble. But I still always feel short on time! Everything takes 2-3x longer than anticipated e.g. building a website, executing on digital advertising, developing shirt products etc. I work on average 10 hours a day, 7 days a week with my co-founder Wesley Kang and it still doesn’t feel like we’re getting enough done. But it’s all part of the entrepreneurship hustle! Thanks Tanya for sharing your startup brand identity and design advice! Starting a startup can be scary. But when you put in the (smart) research and actually solve a problem people care about, good things fall into place. And we love the idea of using Instagram as a focus group!